At the beginning of June we extended our Share the Warmth campaign for its final weeks. We called out to you again to help us find homes for the charismatic cats and kind kittens in our care, and you heard our call! This means, around 63 fabulous felines were adopted each week during the campaign. 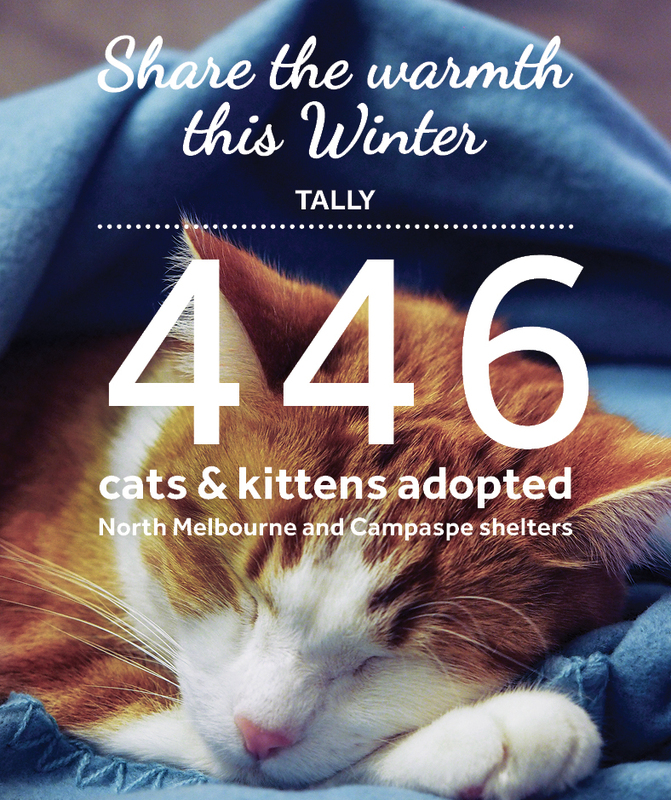 According to North Melbourne Shelter Manager Alisa, the response from the community to the campaign has been fantastic, but there are still a large number of cats and kittens waiting to find their forever home. “Despite the great response from the community we are still finding that the moment a cat or kitten is adopted, there is another waiting to take its place. “On top of this, we also have a number of cats who have been up for adoption for 100 days or more, including Lion King from North Melbourne, who has been available for adoption for 100 days and Dudley from Campaspe who has been looking for his forever home for 231 days,” said Alisa. Even if you are unable to adopt a cat or kitten from the Home, there are still ways you can help us continue to find new families for the cats and kittens in our care, including advocating for the animals in our care. “Spreading the word through social media, or word of mouth, is a great way to let people know about the benefits of adopting a companion animal through a shelter or rescue group. “We want the community to continue to spread the word so the animals in our care can go on to find loving homes and receive the love, care and attention they deserve,” said Alisa. Even though Share the Warmth has ended, you can still help us find homes for the cats and kittens in our care. Adopt: View our terrific range of cats and kittens awaiting adoption at dogshome.com/cat-adoption. You can also come down to our shelters at North Melbourne and Campaspe to meet our fantastic felines in person. Our staff are keen to find you your perfect match! Foster: We are always on the lookout for foster carers to care for our cats and kittens for an average of two to four weeks. This is a terrific way to give a cat some much needed time out in a normal home environment, while creating vital space at our shelters. All expenses are covered and successful foster candidates will be notified within two weeks of applying. For more information visit our foster care page. Advocate: Can’t adopt or foster? Why not advocate for an adoption candidate currently seeking a home? Share adoption candidate profiles via your Facebook page, email or via good old word of mouth.